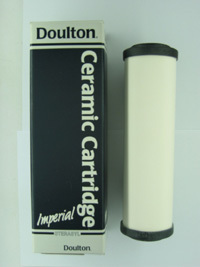 Replacement ceramic cartridge for drinking water systems. 10 in x 2.5 in. Use this cartridge with a carbon cartridge in the twin drinking water systems. This cartridge can be cleaned using a kitchen scouring pad, then reused. It is impregnated with silver to inhibit bacterial growth. With an absolute filtration rating of 99.99% at 0.9 micron this cartridge is effective in removing sediment, turbidity, protozoan cysts and bacteria. Click here to see or download a pdf file that is a test report on filtered vs unfiltered water using a ceramic cartridge Ceramic cartridge report.